A new World Bank note finds that Asian countries have reduced the number of people living in poverty — but work remains. Growing economic prosperity in the Asia-Pacific contributed to a sizeable decline in the percentage of the developing world that lives in extreme poverty over the last three decades, according to a new World Bank note. The World Bank also notes that the developing world’s population grew 59 percent over the same time period. Therefore, in absolute terms, the number of people in the developing world living in extreme poverty only dropped from 1.9 billion in 1981 to a still painfully high 1.2 billion in 2010. Still, an encouraging number of Asians were lifted out of extreme poverty over the last three decades. This was particularly true in East Asia, where China not surprisingly led the way. In 1981 an astonishing 84 percent of Chinese citizens— 835 million people— met the World Bank’s criteria for extreme poverty. In 2010 only 12 percent of China’s population, or 156 million individuals, fell into that category. 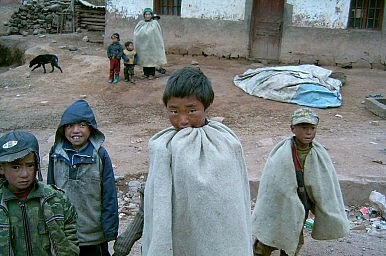 Thus there were nearly 700 million less Chinese living in extreme poverty in 2010 than in 1981. Furthermore, China’s poverty eradication appeared to accelerate over time. From 1981 to 1990 China’s poverty rate declined from 84 percent (835 million Chinese) to 60 percent (683 million). Over the next decade ending in 1999 it fell to 36 percent or 446 million people. Just a third of that percentage, 12 percent (156 individuals) were still living in poverty in China in 2010. Indeed, although many Chinese consider the Hu-Wen administration to have been a “lost decade,” the number of extremely poor Chinese fell from 363 million to 156 million in the first eight years of their time in power. The other countries of East Asia were also relatively effective at eradicating extreme poverty in their countries. Whereas 61 percent of them lived in this condition in 1981, only 13 percent did in 2010. This latter number still meant 90 million individuals were living in extreme poverty, but this was dramatically better than the 261 million in 1981. Furthermore, like China, other parts of East Asia saw the number of their citizens suffering in extreme poverty decline by a faster rate over time. Whereas between 1981 and 1999, the number of poor individuals in East Asia countries excluding China dropped from 261 million to 209 million, the number of poor individuals declined from 209 million to 90 million from 1999 to 2010. Although not as dramatic as in China, India also made considerable progress in lifting its citizens out of extreme poverty over the last three decades. The World Bank estimates that in 1981, 60 percent of Indians lived in extreme poverty. By 2010 that figure had declined to 33 percent. Furthermore, despite its steadily growing population India now has 29 million less citizens living in extreme poverty than it did in 1981, when 429 million Indians were considered extremely poor by the World Bank. Other South Asian countries have also witnessed dramatic declines in the size of their extremely poor population, at least when considered as a whole. Whereas 66 percent of all South Asians excluding Indians were extremely impoverished in 1981, the number had fallen to 26 percent in 2010. This means that an Indian citizen is more likely to live in extreme poverty than are citizens of other South Asian nations considered as a whole. Because other parts of the world fortunately made great strides in fighting poverty during this time period, the Indo-Pacific region’s success was decidedly more mixed when viewed in relative terms. On the one hand, with 20 percent of the world’s poor in 2010, China and East Asia accounted for a dramatically lower percentage of the world’s poor than they did in 1981, when China alone was home to 43 percent of the people living in extreme poverty and the rest of East Asia boasted13 percent of the global poor. On the other hand, South Asia saw its share of the world’s poor increase considerably during this time period, from 29 to 42 percent. Much of this increase came from India; whereas 22 percent of the world’s extreme poor called India home in 1981, 33 percent did by 2010. The World Bank considers the poverty line to be US$1.25 per day in 2005 Purchasing Power Parity (PPP) dollars. The global average extremely poor citizen lived on just 87 cents per day in 2010.